Apparently, this is one that we missed from last week, but we wanted to bring it along anyway, because we know that some of you out there are fans of the ZENONIA series. Last week, GAMEVIL released ZENONIA 5: Wheel of Destiny into the Google Play Store. The game continues on the action RPG gameplay of previous ZENONIA games. The story of Wheel of Destiny takes place a long time after the events of ZENONIA 4, where (surprise!) the peaceful land is no longer peaceful because of corruption and evil and stuff. You all know how ZENONIA games work at this point: bad stuff happens, you kill stuff with swords and magic, and a good time is had by all. Surprisingly, GAMEVIL isn't really touting any new gameplay elements in this game, just extensions of the old tried and true. But, the ZENONIA games have been some of the best on mobile, so that's not really a bad thing. 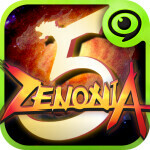 ZENONIA 5 is available right now in the Google Play Store for free, no word yet on when it will be released for iOS. A bit behind... Had this game since last week. Read the first sentence dude. My guess is that similar to apps like Music Junk, Google gave "ROM Grabber" the boot to the backside. However... where there's a will there's a way, they say. I haven't looked in a while (I've been behaving myself) but 3rd party app stores like GetJar may have some similar ROM grabbing apps.